We’d love your help. Let us know what’s wrong with this preview of Hear, My Son by Daniel J. Estes. To ask other readers questions about Hear, My Son, please sign up. Daniel Estes, a fine scholar on the poetry of the Old Testament, contributes this volume in the celebrated New Studies in Biblical Theology (NSBT) series by IVP and edited by D. A. Carson. This monograph considers Proverbs 1-9 for what it tells us about teaching and learning. He feels that the obvious pursuit in Proverbs is one of education or instruction. The teacher speaks to the student throughout. Though there appears to be a random order in our collection of Proverbs, he see seven pedagogica Daniel Estes, a fine scholar on the poetry of the Old Testament, contributes this volume in the celebrated New Studies in Biblical Theology (NSBT) series by IVP and edited by D. A. Carson. 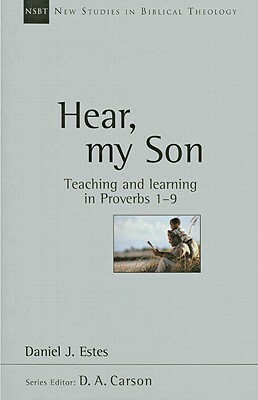 This monograph considers Proverbs 1-9 for what it tells us about teaching and learning. He feels that the obvious pursuit in Proverbs is one of education or instruction. The teacher speaks to the student throughout. Though there appears to be a random order in our collection of Proverbs, he see seven pedagogical categories that holds them together. These seven are worldview, values, goals, curriculum, instruction, teacher, and learner. He encourages us to notice “hear my son”. He covers a few more broad issues in the introduction. In chapter 1 he uncovers the worldview of Proverbs 1-9 and explains the assumptions of it. He says it’s evident that it “implies a prior faith commitment.” Further, in biblical wisdom there’s no differentiation between the sacred and the profane. From there, Mr. Estes traces out the theological points at work. The book hits its stride in chapters 2 and 3 when the values and goals for education are explained. It was in these two chapters that I learned the most and felt he made the strongest case for his premise. Chapters 4-7 cover his other pedagogical categories in turn. Along the way many key words and verses are brought to light. Though it only covers 9 chapters, this book is an excellent resource for studying Proverbs. It certainly lives up to the lofty status of this series. Estes takes up a "worldview-ish" examination of pedagogical practice in Prov 1-9. While I've grown away from thinking worldviewishly, I still find value in the reflective attention to the text and the ways this text shapes us evident throughout HMS. Proverbs 1 to 9 is an extended address on the value of wisdom from a father or elder teacher to a son or student that introduces the wisdom sayings of the remainder of Proverbs. Daniel J. Estes has taken a novel approach to this literature and written a monograph exploring the philosophy and practice of teaching and learning reflected in this instruction given in these chapters. It is part of the New Studies in Biblical Theology series of monographs. That may sound like dry, stodgy stuff but what Proverbs 1 to 9 is an extended address on the value of wisdom from a father or elder teacher to a son or student that introduces the wisdom sayings of the remainder of Proverbs. Daniel J. Estes has taken a novel approach to this literature and written a monograph exploring the philosophy and practice of teaching and learning reflected in this instruction given in these chapters. It is part of the New Studies in Biblical Theology series of monographs. That may sound like dry, stodgy stuff but what Estes does is outline in a very straightforward fashion what we might learn from these texts about teaching and learning. The book is not an exposition of Proverbs 1 to 9 but rather a study of this discourse through the lens of what it teaches about education. Here is the outline of the book. After an introduction describing and giving a rationale for this study, Estes looks first at the worldview underlying Proverbs as one seeing the universe as God's creation, one with a moral order and rationality that reflect the character of God, and thus implying a proper reverence for God by humans and other creatures. He then turns to values for education, of which the top one is wisdom which is understanding how to live well and in accord with God's order in the world, teachability, righteousness and life. Then follows a consideration of education's goals: commitment on the part of the learner, growth in character, competence in living, protection from folly and its consequences, prosperity and the knowledge of God. The next sections turn to the nuts and bolts of education. Proverbs 1-9 describes a threefold curriculum of learning through observation of the world, through instruction in traditional wisdom passed along, and through revealed truth from God. He then turns to the educational process evident in this discourse which includes an address ("hear, my son"), description of the wise and foolish, various forms of commands, incentives, and an invitation to embrace the teaching. This then leads to a consideration of the role of teacher and learner in this process. Because the teacher alternates between expert authority and the role of facilitating wisdom's embrace, he sees the teacher as functioning as a knowledgeable guide in the learning process. Conversely the learner must receive, respond to, value and assimilate wisdom. Estes then concludes the book by summarizing these chapters and outlining avenues for further exploration as well as by offering few comments on contemporary education. What I most appreciate about this book is that it articulates an approach to education that integrates faith and rigorous study of the world rather than bracketing these off into separate ventures. In fact, the earliest scientists studied the world as well as theology to understand God's order. Similarly, tradition, history, literature, and philosophy need not be opposed to either theology or science but all function together as a comprehensive curriculum to teach the fear of God, the order of creation, the cultivation of moral character, competence and common sense in the conduct of life. Competence and character, reason and faith walk together. In sum, this book is a concise work that gives fresh insight into an aspect of Proverbs--teaching and learning--that has relevance for anyone engaged in the educational enterprise and particularly those who want to think Christianly about how education is done. A great book that synthesizes the material in Proverbs 1-9 concerning the pedagogy implicit within the text. Lots of excellent exegetical insights that the preacher and teacher will find helpful. Highly recommended. Daniel J. Estes (Ph.D., University of Cambridge) is professor of Bible and dean of the school of biblical and theological studies at Cedarville University in Ohio. His books include Hear, My Son and Handbook on the Wisdom Books and Psalms.